ISLAMABAD: Pakistan officially asked for financial support from the International Monetary Fund on Thursday in a meeting with IMF Managing Director Christine Lagarde in Bali, Indonesia. 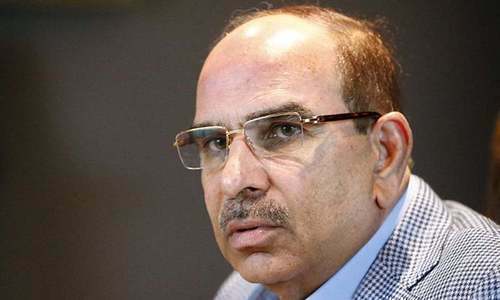 No statement was released by the Pakistani team, though Finance Minister Umar had made it official that he would be seeking Fund’s support before his departure for Bali on Monday. “An IMF team will visit Islamabad in the coming weeks to initiate discussions for a possible IMF-supported economic programme,” Ms Lagarde said, adding that the Fund looked forward to “the continuing partnership” with Pakistan. This will be Pakistan’s 13th loan from the IMF since 1988 when the era of structural adjustment began. Just before going into the meeting with Pakistan’s finance team, Ms Lagarde was asked about Pakistan’s growing stockpile of Chinese debt at a press conference. “[W]e need to have a complete understanding and absolute transparency about the nature, size, and terms of the debt that is bearing on a particular country,” she replied, words that echoed widely around the world as multiple global news outlets picked them up. Nowhere did she specifically mention Chinese debt, though global news outlets added that missing link for her, causing concerns about Pakistan’s growing stockpile of Chinese debt to grow further still. 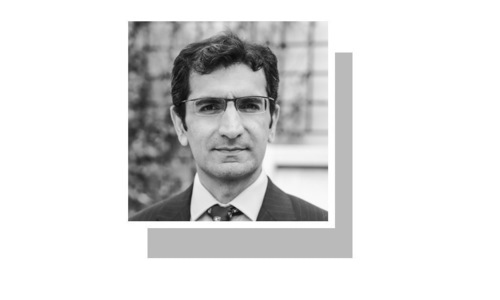 The question of how the IMF will deal with the Chinese debts of Pakistan has dogged the run-up to the approach for assistance that began formally on Thursday. US Secretary of State Mike Pompeo had in July issued a stern warning to the IMF that its funds should not “go to bail out Chinese bondholders or China itself”. Those sentiments were later echoed by a number of US senators, as well as a few global media outlets. Ms Lagarde, instead, made it clear that the issue of debt transparency and appropriate understanding of debt was not only applicable to Pakistan but also to all countries. 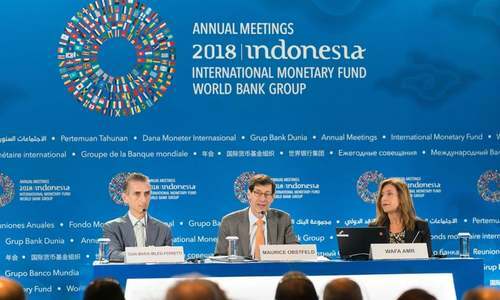 “It is part of a necessary disclosure exercise that we have to agree with our members for the purpose of a debt sustainability analysis,” she said, adding that debt disclosure was also important for the purpose of the governance and corruption project approved by the IMF board and now being implemented. The Fund appears to be caught in a high wire act. The United States is the largest contributor of resources for the IMF and has 16 per cent of the votes on the Fund’s board, but China is not far behind with 6pc, and the Fund cannot by its own rules refuse to lend to a member country. Ms Lagarde cannot afford to anger either of these two countries. “We have to serve the entire membership, each and every one of them,” she told reporters when asked specifically about Pakistan’s Chinese debt. Officials said the finance minister is scheduled to return to Islamabad on Friday night. A heavy agenda of choices awaits him on his return, including a Rs2 per unit (almost 18pc) increase in electricity tariff. This will be followed by a Fund mission. The process can take four-five weeks before an agreement is reached, during which both sides need to work out the exact size, tenure and conditionalities of the programme. The finance ministry expects a three-year programme of $7.5bn based on a recent weeklong discussion with the IMF, but a final decision will be made by the Fund, ministry officials told Dawn. Sources said the government was in the process of completing some ‘prior actions’, including increase in gas and electricity rates, currency depreciation following IMF’s call for a free float and increase in central bank’s policy rate. The Fund has already indicated authorities to take further tough decisions, including increase in energy prices, additional taxation measures and structural reforms like “strengthening the performance of public sector enterprises”. On Thursday, the government also announced the appointment of an air marshal to lead the Pakistan International Airlines, saying he had been tasked with “immediately fixing the institutions financial condition”. An IMF team led by mission chief Harald Finger concluded a 10-day visit to Pakistan on Oct 4, a week before the Bali meeting. 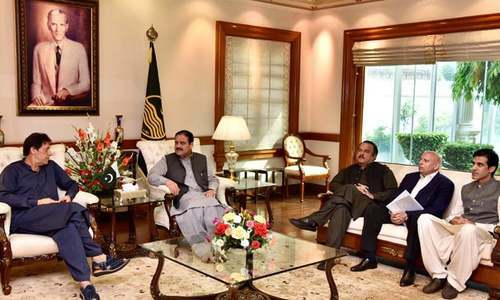 The official reason given for that team’s presence in Pakistan was for routine Article IV consultations, but the government dropped hints that these talks could lead to programme negotiations. That is what appears to have happened. The team noted that Pakistan had begun taking corrective action against its growing fiscal and external imbalances as far back as December 2017, noting also more recent steps by the current government. But it added that these were inadequate, and “[a]dditional decisive policy action, anchored in a comprehensive strategy, and significant external financing will be needed in the near term. Policies should include more exchange rate flexibility and monetary policy tightening, further fiscal adjustment anchored in a medium-term consolidation strategy, and strengthening the performance of key public enterprises together with further increases in gas and power tariffs”. At least now world including Pakistan will come to see what is treated till now as hidden in CPEC agreements. 13th loan since 1988? Perhaps IMF should open a branch in Islamabad so that ministers don't have to travel around seeking bailout. Is $7.5 billion dollar package is enough, I doubt. Fund's MD says it needs "complete understanding" of "nature" of loans that Pakistan has borrowed from other countries - but the Pakistan Tehreek-e-Insaf does not have access to those numbers. So where do they go from here? Imran Khan government has to take tough austerity measures, like Greece, Argentina. Common people, like the middle class will feel the pinch. Hope it doesnt become another Venezuela, with deep economic crisis. .
Greece recovered, from economic crisis, cutting pension, salary, raising taxes to an extent, will Pakistan be able to do, Skeptical. Paying off another loan with another loan, but what about the interest. More over Imran Khan states in six months he will bring back the economy, question is how. He is an ex-cricketer, not an economist. Imran Khan needs a magical wand, to change the economy, which will be tough to recover. With high cost of fuel, less exports, more imports, Chinese debts (CPEC- US $60 billion ) plus other debts, and now another $ 7.6 IMF loan, recovery is impossible in 6 months as promised. $7.6 US billion is almost a peanut to pay off, massive Chinese CPEC which is $62 US billion, besides China is building railways, roads, metro and other projects. Pakistan cannot reveal the details of CPEC without the permission of China. This is a big problem. Cut imports, slash salaries of ministers, politicians, and others, raise tax on transportation, is the only way, it can recover. Unnecessary expenditures, such as travelling by ministers and politicians in business class, has to be stopped. So many keyboard economists here - giving suggestions which are out of common man's reach. One simple and most effective thing sverybody can do - control your population. Congrats on new 7. 5 billion loan. The question is in last 70 years country has been a failure and can't bear its own expenses. Idea of sir j reamins a failed vision. Fair enough. The bank needs to know all your current liabilities before arriving at your repayment capacity. while standing on container IK shouted "Listen to me, those who are extending loan to Pakistan Government, Listen, I wont return these loans if i ever came to power"........ that is why most of the countries are not willing to extend loan to PTI Govt. They may grant a hearing of the pleas in the coming weeks or months. If you accept their terms, they may even give you some percentage of the requested amount to return some of the loans due from you. Rest you can arrange from elsewhere at heavy costs as interests. "Nowhere did she specifically mention Chinese debt, though global news outlets added that missing link for her, causing concerns about Pakistan’s growing stockpile of Chinese debt to grow further still"
Hey zak, please tell global news outlets that there are no loans from iron brother and we don't need imf and we will give trillions of dollars when CPEC is complete"
Pak should remember the tantrums of IMF, and pay them soon, and devise economic reforms in such a manner, never in future ask for help. Get ready for tough times and belt tightening. No respite in sight for any one rich or poor. All will be equal struggling ends to meet. the condition of economy is on that stage where there is no other way. obviously bringing back looted money and controlling the money laundering is the permanent solution but it will definitely take some time. I guess After election drama finally end up . This government interested in talking revenge from last government rather than focus on running properly channeled. @Asad Shame those who stole the 12. This will be Pakistan’s 13th loan from the IMF since 1988, Who took the 12 before? @Asad Shame on PTI??? The debt burden has been created by past govts and now we face a fiscal deficit with little choice but to fund it via a bailout of similar size. I think you need to improve your understanding of the issues before you become judge & jury. Its really heart breaking how the governments of past 10 years have played with the economy especially the Lahore Centered Government of past 5 years. May all the culprits who have played with our economy get what they deserve. It would be good for Pakistanis as well as overseas investors. This will give the right financial directions to government also. How about giving a try with India? They have 400B USD reserve..
What happened to those tall promises - NEVER to go to IMF? @Kris Unwarranted comment, especially as Pakistan is a high status nation with highly educated middle classes an nuclear weapons. Gita Gopinath will be IMF chief economist from 2019. Hopefully she will be sympathetic with more understanding of Pakistan's problems. IMF should give these loan money to China, instead of falling into few greedy hands. 13th bailout package, this shows incompetency of our government , if the lesson is not learn from the past we will get soon 130 bailout package soon. What a photograph. Such a great contradiction in the body language as is seen. 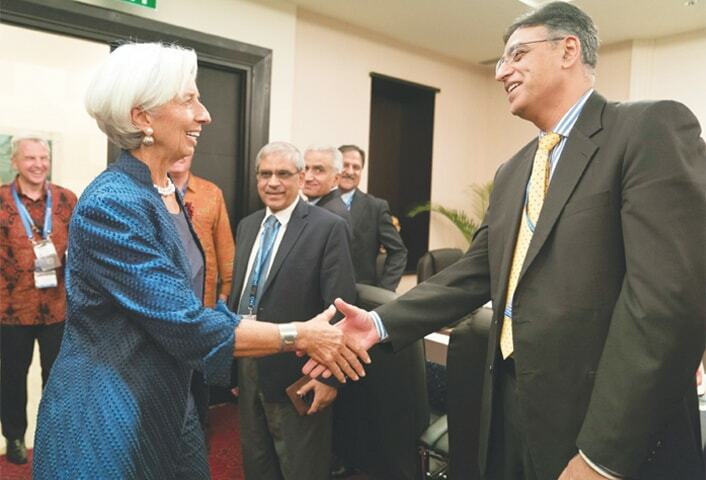 Asad Umar looks like an emperor, about to oblige Cristin Lagarde. @MG Keep your money under your pillow and get a good day's sleep. We have managed without any help from our eastern neighbours and can live without any help from them all the time. Bad news for China.. If CPEC terms are open to public the illusion that China is friend will go away and real face will be exposed again. @Brian IK will take another U turn after 6 months. @Atif than no IMF bailout package. If the most of the package can not use used for development purpose that will aid revenue generation, the package will only be a temporary relief. This is where hidden cost of CPEC will come in to play. Unless thee Chinese agree to convert their loans to investments, there does not appear much hope. Another way to look at it is, as an independent audit. The Govt would get an independent opinion of the States' finances. Then it could take a decision as to the best course of action. IMF is a juice extraction machine that squeezes ordinary people in the name of country's Structural Adjustment Programme (SAP) and extracts the nation's sap of life many times more than the money it loans, thus making the nation perpetually poor, for all times to come. The Pakistani negotiating team missed a trick - the nuke option. Threaten the world with devastation and loan would be granted in a jiffy. @Howard “”..ex-cricketer, not an economist..” others were not born politicians either!! Nawaz a foundry owner, Zardari a cinema owner family, khurshid Shah a metre reader and now a... Please give IMRAN Khan an opportunity to changer countries inherited misfortunes..
13th loan since 1988.Wow!!! It seems like IMF was opened only to bailout Pakistan.IMF should transfer its headquarters to Islamabad.It will be convenient for both IMF and Pakistan. How can the IMF say that they will not take Chinese borrowing into account? @Thiru . Don't you guys ever read international media? I was very confident that CPEC will be game changer for Pakistan. But didn't expect it will change everything so soon. Best of luck. PTI leaders are on record slamming IMF and its methods. I am sure that the IMF people have also read some of it. Now the same people want IMF to hurry up and hand over 7.5 billion dollars !! I don't think IMF will be in any hurry to disburse the funds requested by Pakistan. They also know that Pakistan requires nearly 12 billion by December to avoid default. US debt has gone from $10 trillion to $21 trillion from 2008 to 2018. They should also have a parliamentary commission to find out why and who looted the money..Expanding economies soak up debt. IK should concentrate on running the economy with an exchange rate Rs104 and predictions to be in the G20 by 2020 as his predessors had achieved for 4.5 years rather than disrespect the achievements of others. His failure to control the market or give investors any confidence in Pakistan has already cost Pakistan trillions in the past 7 weeks with no end in sight. We are a ship with no pilot in stormy seas. @Thiru.Please don't talk about your Nuclear Weapons again while asking for financial help from the world for cash. It could be counter productive. I think Pakistan will get IMF help. @Vivek you need to take some math lessons . 40 million a day even if true means 200 days of import not 20. The oil bill is also not what you’ve quoted because of energy subsidy from Saudi upwards of 3 billion USD . The short answer is that the IMF loan is required to re-vitalism the economy so that the gap between import and export shrinks. The gap has grown because of balance of payments on term loans among other political instabilities for business growth. Lingering effect of PML-N and PPP. "US debt has gone from $10 trillion to $21 trillion from 2008 to 2018. They should also have a parliamentary commission to find out why and who looted the money..Expanding economies soak up debt. " The data regarding the US is all in the public domain. Read it if you want. In any case, the US is not asking for a bailout from IMF, Pakistan is. Expanding economies do soak in debt - Question which bit of economy in Pakistan is expanding? @Firdous Greece got 500 BILLION from the EU..no one in the planet trusts you with a dollar man. @Nadir "US debt has gone from $10 trillion to $21 trillion from 2008 to 2018. They should also have a parliamentary commission to find out why and who looted the money." Your concern should be addressed to the proper authorities, my friend. @BK "Don't you guys ever read international media?" Ne need my friend, you're here to inform us. We enjoy it quite a lot. @Asit Ghosh "Threaten the world with devastation and loan would be granted in a jiffy." This may work as well at a proper time. But we're not there yet. @SHAHID SATTAR "We have managed without any help from our eastern neighbours and can live without any help from them all the time." But they can't manage without us. Pakistan is the only country in the world, which doesn't seem to be interested in their market, they can't understand why. @Pradeep K "Hopefully she will be sympathetic with more understanding of Pakistan's problems." We don't need sympathy, but just money. She'll be there to provide it, it will be her job. @Jason: But they have big oil reserves. Number 1 ranked ? @BK They have absolute power. Only people power can do that. But the public is sold to the idea that they are the saviours. @WARRIs and as per your argument Imran specializes in finance? I guess imf will grant maximum 6 billion around. @BAXAR You will understand if you were interested in history and have gone through whatever has taken place between these two countries since the liberation from the British and the partition of the sub-continent. @Shahid khan then you don't know about your trade deficit. It is approximately $35 billion of which $16.5 with the Chinese excluding cpec related import from them. US has 16% vote and China is not behind with 6% vote. No difference between 6 & 16? No wonder Pakistan is in economic trouble. @SHAHID SATTAR " You will understand if you were interested in history " I understand very well. They don't. They are currently suffering from some kind of delusion of grandeur. They think we see them as important as they think they are. Actually we think they are important to us, but not THAT much. @nkc nkc Have you tried to take a bank loan without having to reveal ALL your finacial data. @M. Saeed What do you think Pakistan politians were doing to awam , giving them milk & honey? @Kris and save some foreign exchange for the benefit of the poor of the country. An expected bunch of prerequisites demanded by the IMF. Besides 18% hike in the electricity tariff, further changes in the taxation regime hidden common man, steps to monetary policy tightening & medium term fiscal adjustments & possible privatization of WAPDA, PIA, PSM , Railways, public owned Gas Co’s & others, a cause of loss.of Rs.1.3 trillion so far & with billions added each month. On top of all this a very difficult preposition culminating in thorough scrutiny of terms & conditions of CPEC loan, which mostly remains in shrouds of secrecy so far. This 13th foray by Pakistan would be most difficult one,because of the government ‘s continuous wavering of not going to IMF & being forced to take U-turn because of exhaustion of all other options - retrieving $20 B laundered money, donations from expatriates and monetary help of billion from KSA & China. This meeting bringing difficulties to common man, would test the prowess of ecoomic team’s dealing with incisive scrutiny by the IMF. When top command changes and corrective measures are being taken, bridging loans are a temporary source of financing. PPP and PML-N used to got to IMF to syphon of some for own benefit, while PTI is going to IMF to help clear up the mess. It will be granted with some restrictions. No repayment of Chinese debt from IMF loan? @BB Do not worry! Few years after, you will get a chance to add one more party to your list. @Nadir there is vast difference between taking part in share trading and business investment (FDI & di). Floating stocks, bonds, notes attract portfolio investment based on speculation on other's success in doing business. It can create temporary pressure on domestic currency but can not direct a state economy actually it is otherwise. In a section of Pakistan's media I often find it amusing listening some interpretation of investment. Some time Stock exchanges can be used to send wrong message to the outside investors deliberately. Point to note that KSE is under control of Chinese. Kick the cricketer and hire an economist -- Manmohan is available to volunteer, let me know, I'll make a phone call.